A Washing Machine is an electric appliance that uses a hot and cold water water supply along with a motor that agitates the water and clothes in a rotating drum to do the work of cleaning your clothes. 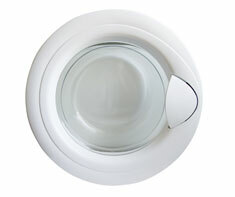 Some models of Washing Machines are stand-alone units, and some models are integrated with a Clothes Dryer. If your model has a Clothes Dryer unit with it, then you should put checkmarks for BOTH Washing Machine and either Clothes Dryer (electric) or Clothes Dryer (gas) in your Home Wizard app, depending on whether your Clothes Dryer is an electric or a gas unit. Most automatic washing machines typically follow a basic cycle: fill with water, wash/agitate, drain water, rinse-spin, deep rinse, rinse-spin, then spin dry. Washing machines are ruggedly built to withstand the violent back and forth motion of agitating a heavy load, and the high-speed spinning that follows. Clothes Dryer and Clothes Dryer (gas). Shown in the 'Routine Care' section are the recommended routine maintenance tasks for your washing machine. The 'Q & A' section shows answers to common questions. And the 'Articles' section provides helpful articles about your washing machine.